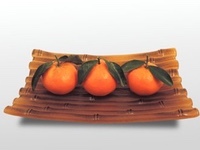 With only two firings you can create striking platters and plates with our Bamboo design. 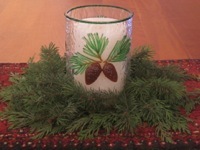 Visit any tropical local and you will see monstera plants climbing up the trees. 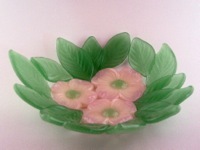 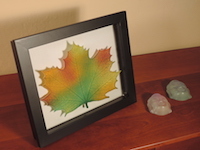 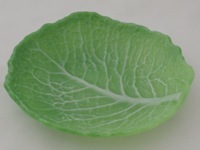 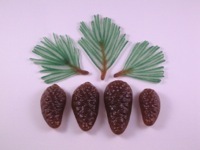 Our molds makes a huge leaf that can be slumped into bowls or platters, or mounted for wall art. 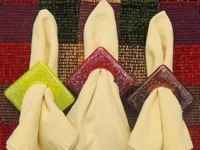 Fill our napkin rings with any color frit to match your, your friends', or your customers' decor. 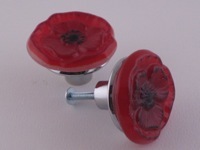 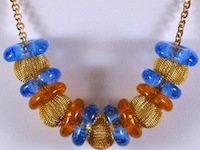 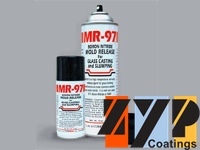 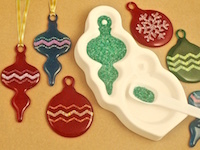 Embellish with decals, enamels, frit balls, or cast elements. 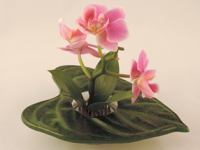 Simple, but quintessential, ikebana vases can be created with Colour de Verre’s Kiwi Leaf, Northwoods Maple Leaf, Rain Forest Leaf, Tropical Leaves, and Lilly Pad designs. 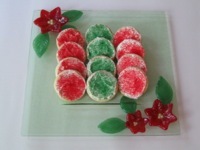 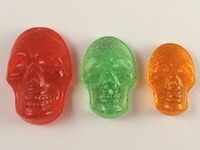 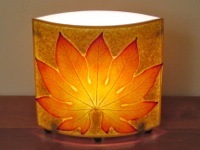 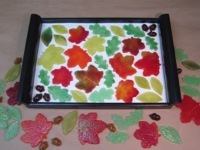 Create an autumn leaf by filling the mold with mixtures of red, oranges, and yellows or a spring version with greens. 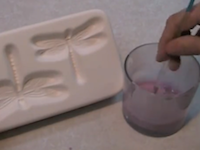 Flip the mold to discover a custom slumping surface that changes the cast leaf into a perfect plate. 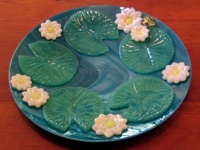 Cast beautiful leaves on one side of these molds and then create perfect dessert and hors d’oeuvres plates with the integrated slumping surface on the molds’ reverse side. 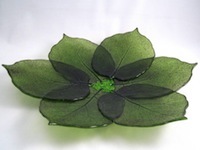 Tack fuse multiple leaves together for dramatic platters and wall sculptures. 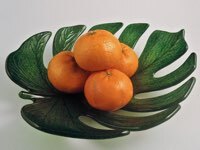 The large leaf cast in Colour de Verre’s Aralia Leaf mold can be can be left flat; slumped individually into a small plate or bowl; or grouped with multiple Aralia Leaf castings to form large, dramatic decorative platters and bowls. 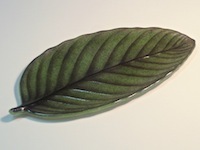 Colour de Verre’s Kiwi Leaf has a bonus: On the mold’s reverse side there is a slumping surface on which cast leaves can be turned into perfect salad plates. 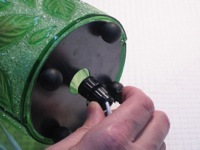 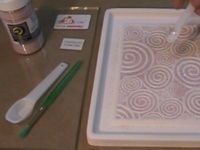 Basic instructions for priming, filling, and firing a Colour de Verre mold. 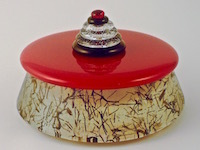 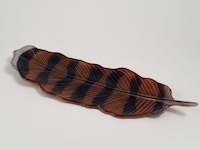 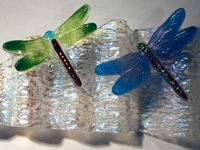 This project sheet details how to make two very different finished pieces embellished with glass rods shaped using Colour de Verre’s Serpentine Formers. 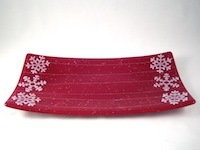 Make these plates for yourself or use as a gift. 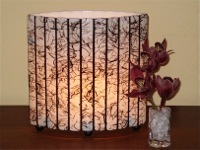 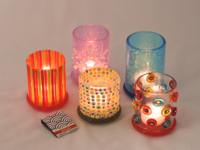 Take advantage of the amazing array of fusible art glass available. 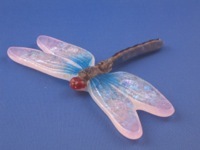 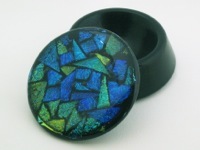 The Small Dragonflies with Wing Slumper mold has been one of most popular design. 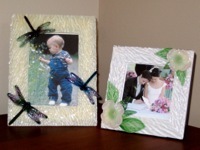 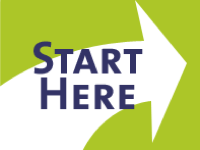 Why not devote a project sheet just to making, shaping, and tacking these designs. 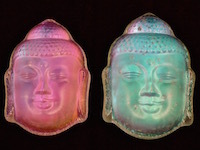 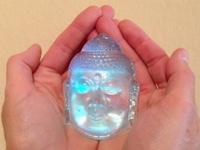 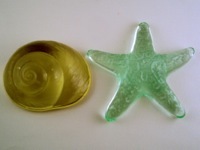 Instructions and tips for creating thin and delicate castings with these three molds. 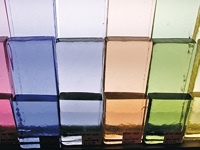 Just like wall paints, glass frit can be mixed to create subtle shades. 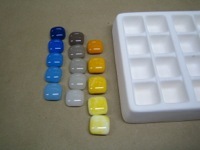 Use our method to create glass versions of “paint chips.” From these chips you can choose the perfect frit blend for a particular project. 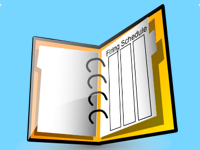 This project sheet is really two project sheets in one. 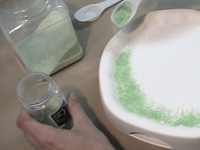 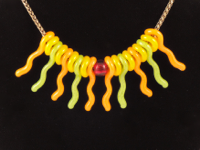 It tells how to make beautiful sea forms plus how to cast pieces using billets and “casting rocks”. 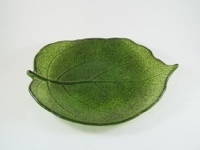 Cast leaves are fused together to form this beautiful table decoration. 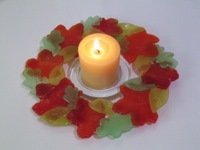 The wreath can also be hung in window to celebrate the season. 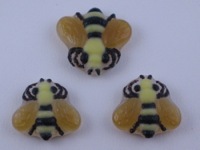 The honey bee, its honey, and its hive are emblems of sweetness, wealth, and eloquence. 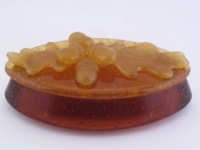 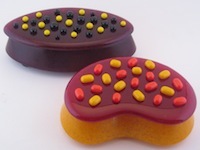 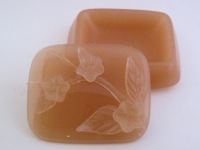 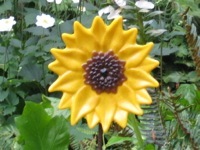 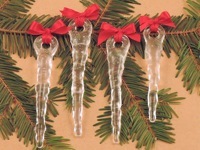 Use the Colour de Verre Honey Bee mold to create three beautiful pins. 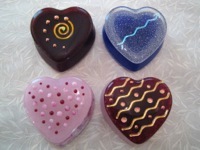 Give them to your three favorite people – or maybe two friends and keep one for yourself. 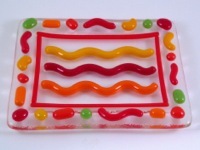 Create a beautiful Summer Platter or fun garden art with this technique. 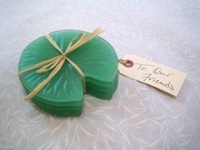 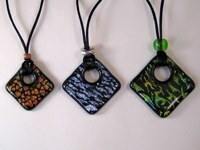 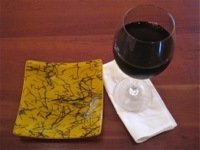 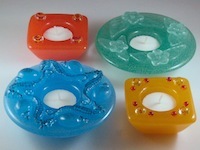 Perfect for giving, these coasters are an easy project for people new to glass casting. 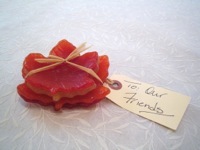 The result is a perfect gift for friends. 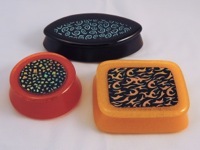 Create functional pieces like platters or plates or decorative wall art using Colour de Verre’s Pattern Fusers. 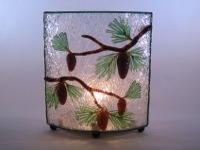 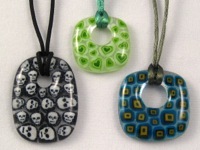 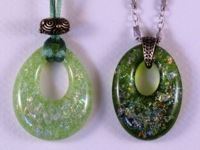 Combinations of frit and sheet glass create almost endless possibilities. 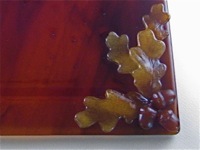 Learn how to create a leaded glass effect using Colour de Verre's Pattern Fusers. 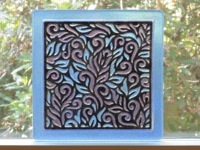 Make both wonderful window art and vessels from the resulting panels. 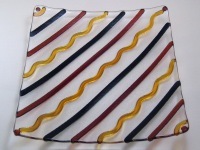 This project sheet is from Uroboros Glass Studios. 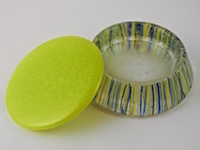 They filled our 10” Round Disk Fuser with beautiful frit mixtures separated by glass “dams” created with our Large Serpentine Formers. 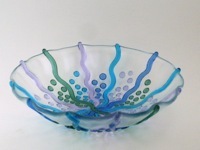 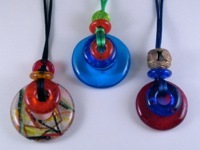 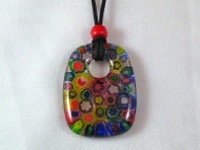 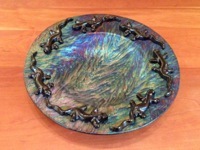 The final piece can be displayed in a stand or slumped into a bowl or platter. 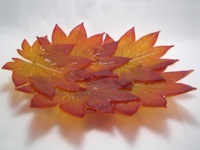 Next time you are invited to a dinner, make a couple of these maple leaf bowls for your host or hostess. 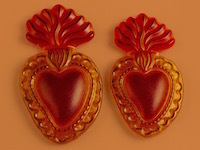 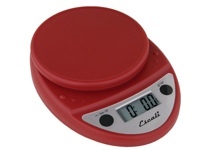 They work great for measure out spices or serving olives or chocolate. 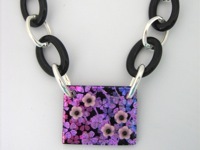 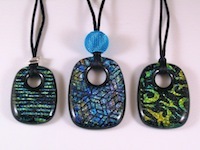 The latest trend is incorporating fused and cast pieces into mosaic projects. 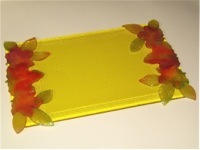 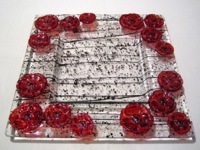 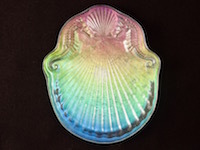 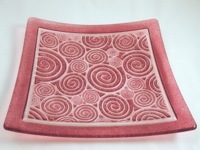 Create this beautiful tea tray using cast elements created with Colour de Verre molds. 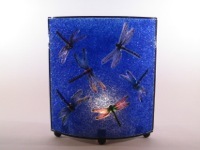 Quite a bit different from the usual glass project. 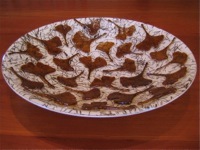 Fuse and slump individual elements - in one firing - to create a beautiful bowl. 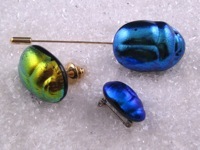 The drawer pulls are an easy-to-make combination of your glass and inexpensive hardware. 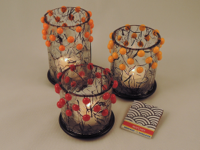 The can be made to match any decor. 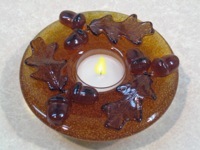 This project can be completed in about an hour - not including the overnight firing. 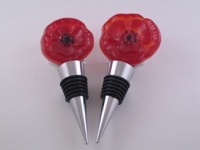 Add a bottle of wine and you have a perfect gift.